Derya Little grew up in a culturally Muslim household in Turkey, but when her parents divorced, it caused her to question everything, including the tenets of Islam. Studying it critically for herself, she was put off by its treatment of women, its chaotic history, and the master/slave relationship between Allah and his followers. She rejected God altogether until she met some Evangelical Christians who had both convincing arguments and compelling witnesses. However, the more she studied Christianity, the more she began to wonder about the question of who had the authority to interpret Scripture, and a study of history and theology eventually helped lead her to the Catholic Church. Happy Feast Day of Sts. Peter and Paul…. When I take my pilgrims to Rome one of my main objectives is to introduce them to the saints – especially Peter and Paul. We meditate on the last days of the lives, imprisonments, martyrdoms and burials of these two Princes of the Apostles: Peter and Paul. 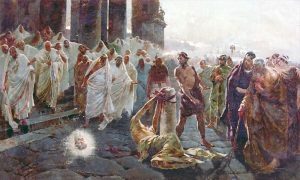 Both of them shed their blood in Rome for Jesus and the Church. 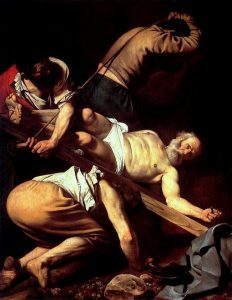 Peter was crucified upside down in Nero’s Circus. We still know the exact spot at the Vatican and the obelisk in the center of St. Peter’s Square witnessed the gory ritual). Paul was beheaded on the Ostian Way (I show you the exact spot and the pillar on which his neck was placed). I love to take pilgrimages to emphasize the utter truth and historicity of Scripture and the tradition of the Catholic Church. We have a lot to learn and be proud of as Catholics and knowing our history and the price paid by the first Christians is a great starting point. “We finished getting all our work done in Lyon for St. Irenaeus. It was very cold and windy — with snow hampering our efforts. We shot video footage for our upcoming DVD in the Footprints of God video series. This installment will be entitled APOSTOLIC FATHERS: HANDING ON THE FAITH. 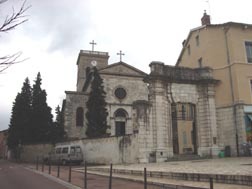 We shot footage at the old and mostly forgotten Church of Irenee on the hillside of Lyons France. Under the church is the tomb of a man that had an incredible influence on me converting to the Catholic Church. Unhappily, in 1527 the Calvinists destroyed his tomb and threw his bones into the river. Only a few fragments remain. 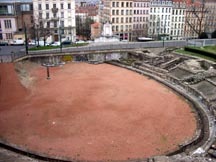 We also found this ancient Roman Amphitheater which was rediscovered only in 1957. You don’t see it now, but in the 2nd century, this arena floor was soaked with the blood of Christians. In 177 about 45 of our brothers and sisters in the faith were gruesomely tortured and killed here in front of jeering crowds. A woman named Blandine was publically tortured for two days as the crowds cheered. The soldiers exhausted themselves with every ingenious torture they could devise. They cut and inflicted and mutilated her naked body for days. Blandine never caved in. When they jeered “Deny your Christ and live!” she would only say back “I am a Christian!” The Christians were placed in a iron chair with a raging fire beneath. The smoke and stench of their burning bodies filled the arena. Yet they never caved in. 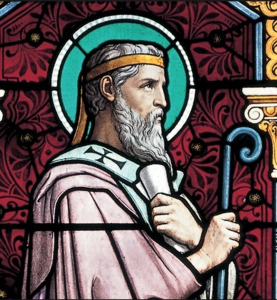 These Martyrs of Lyons and Vienne were true heroes and champions of the Faith. They wrestled to the death and won crowns of life. I was extremely moved in this location. You can read the full story in Eusebius’ History of the Church. We are grateful to Eusebius for preserving this story of Christian martyrdom and heroism. 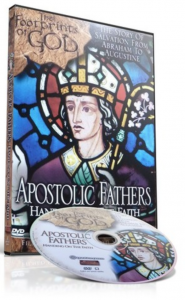 Here is our DVD Apostolic Fathers, Handing on the Faith with its 28-page Study Guide. Can You Find the Books of the Bible? Great day of fun and adventure. Enjoy! Fr. Sean’s excellent and humorous homily here. Steve Ray’s 5 minute talk on “Temple, Circumcision and Gentile Salvation” here. Day 5: Bethlehem all day with Mass in a Cave, Nativity, Dinner and Dancing! We hope you enjoy today’s adventures. Leave a comment and I’ll read it to everyone on the bus. Fr. Sean’s excellent homily here. Mary and the Apostles are Dead! Only Jesus can Mediate for Us! Really? Great first full day in Israel! Enjoy! Fr. Sean Sheridan’s Homily on the Mountain of Transfiguration. Steve Ray’s Talk in Cana here.